G is for Golf: Sports Starting With 'G'? Do you want to know about all the sports starting with the letter 'g'? Here are all the 'G' sports from over 1000 sports listed on our complete list of sports. 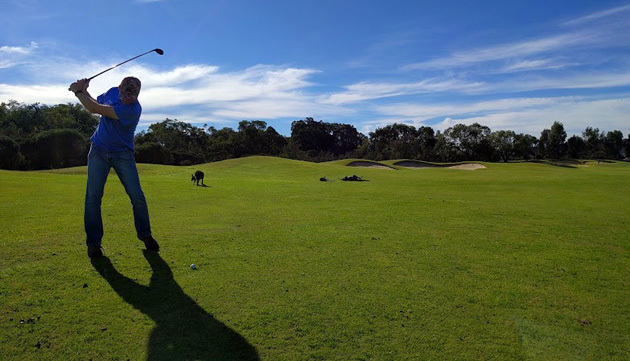 One of the most popular sports around the world is Golf, with lots of versions such as Mini-Golf, Beach Golf, Snow Golf, Urban Golf and Speed Golf. Gymnastics is another popular G Sport. Here we have a short description of just the sports starting with the letter 'G'. If there is a sport missing or some information is incorrect, please make a comment below. Gaelic Football —a type of football from Ireland with a goal similar to that used in rugby but having a net attached below the crossbar. The object is to kick or punch the round ball into the net (three points) or over the crossbar (one point). Gaelic Handball — a wall based sport, played in Ireland, similar to squash though the ball is hit with the hand. Gaming — competitive form of playing computer games (e-sports). Giant Slalom — downhill skiers have to navigate through a fixed set of gates, spaced farther apart than in Slalom though not as much as in Super-G, therefore medium sized turns. Gilli-Danda — a South Asian game played with two sticks; the long stick is used to strike the shorter one in the air. Gliding — an air sport in which pilots use an unpowered aircraft. Glima — a wrestling style from Scandinavia, based on a popular sport of the Vikings from over 1200 years ago. Goalball — a Paralympic sport for blind athletes using a ball with bells. Go-Karting — a motor-racing sport in which small, open, four-wheeled vehicles called karts (or go-karts) are used for racing. Golf — players use a club to hit balls into a series of holes on a course, using the fewest number of strokes. Golf Croquet — a popular form of croquet in which each player takes a stroke in turn, trying to hit a ball through the same hoop. Gorodki — a folk sport from Russia, where competitors strike down a group of cylindrical wooden objects by throwing a bat. Grass Skiing — involves skiing on grass-covered slopes on skis with wheels. Greco-Roman Wrestling — In this wrestling style, competitors are prohibited from holding any part of the opponent’s body below the waist. Gridiron Football — the term used outside of the US for American Football. Guts — a disc sport derived from dodgeball, where players try to strike their opponents with a frisbee. Gymkhana — a multi-game equestrian event which is performed to display the talents of the horses and their riders. Gymnastics — a range of sports combining tumbling and acrobatic feats, usually done with apparatus. Two main sports: Rhythmic Gymnastics and Artistic Gymnastics.